Cathy Diez-Luckie makes history come alive with interactive art activity books. Her Famous Figures series makes the study of history more memorable and lets children make movable action figures of the great men and women of the past. You can currently choose from Famous Figures of Ancient Times, Famous Figures of the American Revolution, Famous Figures of Medieval Times, and Dinosaurs on the Move. At Home School in the Woods you will find a variety of Christian-based history curricula written by Amy Pak. She has created History Through the Ages timeline products, Olde World Style map sets, Time Travelers history based activity studies, activity-paks (both downloadable and on CD) and free unit studies. 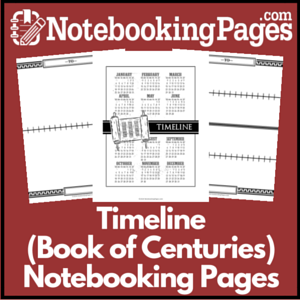 Look here for historical outline maps, timelines, geography curriculum such as A Child's Geography and The Star-Spangled State Book, historical biographies your whole family will love, plus much more. From a "Christian perspective" means that the description of events and the choice of historical figures to set forth as examples reflect an emphasis on patriotism, character, and Biblical truth. The Mystery of History series, by Linda Lacour Hobar, is everything a family needs for teaching history with a strong Biblical worldview. Multi-age activities, book and video lists, memory helps, timeline suggestions, quizzes, and map work included. Chronological, Classical, Complete. Written by Susan Wise Bauer, The Story of the World covers the sweep of human history from ancient times until the present. This read-aloud series is designed for parents to share with elementary-school children, or for older readers to enjoy alone. Use this four-volume set (Africa, China, Europe, and the Americas) alone or combine with Bauer's curriculum guides and tests for a complete elementary history/literature/geography program. Click here to learn more about the books available on Amazon. To learn more about Susan Wise Bauer and The Story of the World series, visit www.susanwisebauer.com.